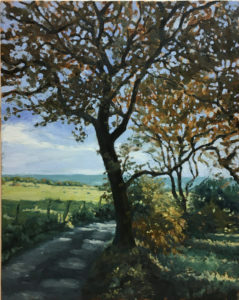 Pete Marsh Art - Landscape > Autumn colours in Spring? 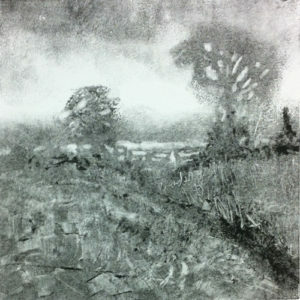 Yes, I know it is Spring but yesterday I delivered three autumn inspired landscape paintings to Leabrooks Arts Complex. It is always good to see Carol and John from Leabrooks Gallery and I was disappointed that I couldn’t stay longer to chat with other artists at the Leabrooks Artist Forum. However, I was on my way to see my youngest daughter, Charlotte, who lives in the West Midlands. Travelling with me on this trip was my wife, Mel and our eldest daughter, Lucy. One of the prints now available from Leabrooks Gallery was inspired by Mel as she sat reading the news on her tablet in the window seat of our hotel room. Traditional newspapers can be seen at the foot of the armchair and the image struck me initially because of the quality of the light entering the room but also because of the mix of old and new methods of accessing the week’s news. 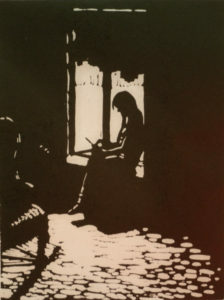 This print is another work where the light entering a room fascinated me. Whilst staying with my friend’s brother, Tammy, in a beautiful Edinburgh flat, he picked up his guitar and started playing. 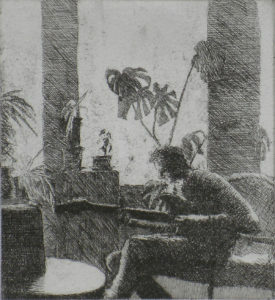 The silhouetted figure and house-plants provided me with an irresistible subject for this etching. What was a lazy afternoon suddenly changed and found me furiously sketching away to try to capture the moment. I am often drawn to the water’s edge and this one attempts to explain the diffused light that is sometimes found when a mist lingers over waterways. Gentle, subtle and always rather mysterious these mists restrict all tones within a very narrow range. I was in Somerset and had waited days for the right lighting conditions to paint en plein air in this field. At last one evening the light was right for me and I settled into a corner of a field to paint. The light changed quite dramatically just by looking left or right. 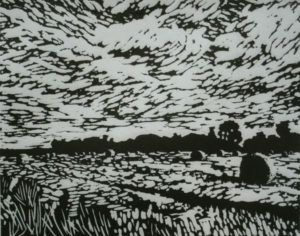 This lino-cut is based on a studio painting that I produced. I will often find additional works from a painting…feeling that a monochrome study will also provide a suitable means for expressing the mood and atmosphere. Looking from the foothills of the Pennines towards busy conurbations, I found a tranquil shaded spot from where I could look across the fields and down the quiet country lane. Painting light from shadows is a theme to which I seem to be drawn time and again. This is a lane in the foothills of the Pennines. I had gone into the landscape with the intention of trying to capture the intense colours of the autumn leaves. The sun streaked through the trees, dappling the lane. The colours of the distant old School House provided lovely cool pinks to contrast with the warmth of the autumn trees. It was a gorgeous day, the sort that lifts your spirits and the autumn sunshine provided a wonderful range of colour and tone. This is the larger studio painting of an en plein air painting produced near St. Abbs and Coldingham, Scotland. I was incredibly fortunate to find this field as it was. The very next day was overcast and fairly grey but more importantly the farmer ploughed over the stubble turning the field to brown! 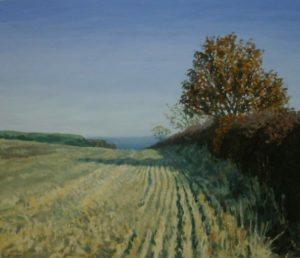 When I painted it the sun bleached stubble along with the rich colours in the hedge-row contrasted with the cool colours of the sea and sky and although I had entered this field with the intention of painting the view looking in a quite different direction, as soon as I saw this view I knew I had to paint it. This was painted from a seated position on my little fold up sketching stool as it provided a much improved view to the view from a standing position. 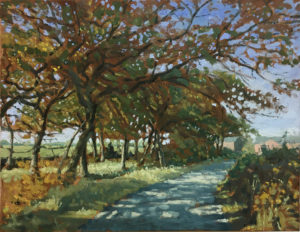 From the standing position the road became visible along with additional hedgerows which cluttered the composition. I preferred the simpler uncluttered view across the field to the sea beyond.